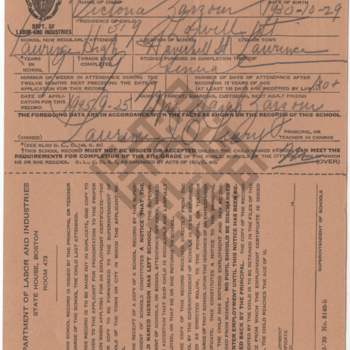 A birth certificate issued on November 5, 1930 by the City of Cleveland Bureau of Vital Statistics, certifying that Victoria Nostas Zarzour was born on October 29, 1930 in Cleveland to Ablon S. Zarzour and Sarah Hamsay Zarzour. A birth record, produced by the City of Boston Registry Department on September 6, 1935. It certifies that Edmund George Samra, son of Abraham and Ella Samra, was born on March 12, 1930. A school record for Josephine Maloof, born May 30, 1916 and residence at 468 Hampshire St. The record was created on January 9, 1930. It lists information about Josephine's studies at Lawrence High School and lists her mother as Mrs. Sadie. Studio portrait of Salloum Mokarzel, c. 1935. (2 pages) This item includes a successful Petition for Citizenship.